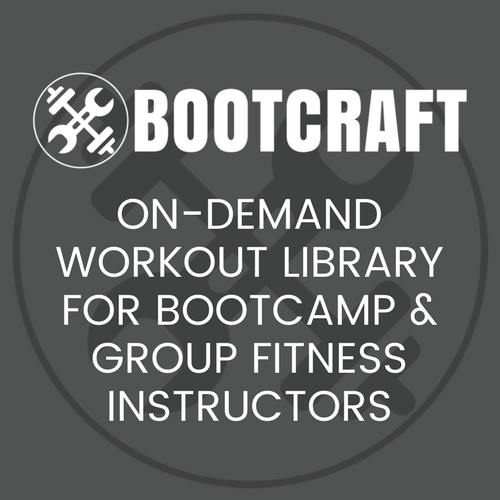 This workout is an entry in our annual Bootcamp Ideas competition from Lori Watson. For 10 – 20 Participants. Groups of 3, working 5 reps at a time per person for each exercise, finish to 75 Reps.
Trainer puts a sticker on each Participant with an Exercise and the reps listed. (Example of my stickers below) Once everyone has a sticker the whole group completes the White Board List (also see below). As each person finishes the White Board List they run to the opposite side of the workout area and waits for the next available person. Once they have a partner, they complete only the other person’s sticker (not their own). When they have completed their partner’s sticker they start again on the White Board List, then head over to the rest area to find their next partner. Each person completes the White Board List after every sticker completed. Note: Partners do not wait for each other to finish, they finish their exercise and reps and carry on to the next round starting with the White Board List. This staggers the whole group so it’s a new partner every time. Note: You can use any of your own exercises. Partner 3 runs to the opposite end or about 25M and completes 2 Burpees runs back and takes over Partner 1 (Plank Hold), Partner 1 takes over Partner 2 (Wall Sit), Partner 2 runs…. I have been leading outdoor bootcamps here in Victoria, BC (Vancouver Island) for about 8 years now at Outdoor Fitness Fun. I specialize in outdoor workouts soaking in the sunshine and getting wet when it rains… (and it rains alot here on the west coast) I love creating new workouts that are fun and challenging. This is something I have used (with small variations) in my bootcamp sessions, feedback was very good! everyone seemed to enjoy! How long do you do the main drill part?